A Hymn for St Cecilia, commissioned by the Livery Club of the Worshipful Company of Musicians to mark Howells’s Mastership of the Company in 1959–60, sets a poem in praise of the Patron Saint of music by Ursula Vaughan Williams as a three-verse hymn. The wonderful dancing-on-tiptoe nature of this piece takes its cue from the syncopated first vocal entry and each phrase finds increasingly high notes as the verse goes on. It is a classic ‘cumulative’ tune which carries the singer along on a tide of increasing emotional energy and leaves an impression of being a piece much bigger than its constituent parts. Commande du Livery Club of the Worshipful Company of Musicians pour marquer l’arrivée de Howells à sa tête, en 1959–60, A Hymn for St Cecilia met en musique un poème à la louange de la sainte patronne de la musique—une hymne en trois strophes d’Ursula Vaughan Williams. Le merveilleux caractère «dansant sur la pointe des pieds» de cette pièce prend appui sur la première entrée vocale syncopée, et chaque phrase rencontre des notes toujours plus aiguës à mesure que la strophe se déroule, engendrant un air «cumulatif» classique qui emporte l’interprète vocal sur une vague d’énergie émo­tionnelle croissante. Voilà une œuvre qui donne l’impression d’être plus imposante que ses composantes. 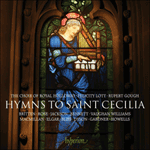 A Hymn for St Cecilia ist ein Auftragswerk des Livery Club der Worshipful Company of Musicians zu Howells’ Ernennung zum Master der Company 1959–1960. Dieses Werk vertont ein zu Ehren der Schutzgöttin der Musik verfasstes Gedicht von Ursula Vaughan Williams in Form einer dreistrophigen Hymne. Die wunderbar vorsichtige Tanzart dieses Stücks übernimmt ihr Stichwort aus dem synkopierten ersten Einsatz der Stimmen. Im Verlauf der Strophe findet jede Phrase zunehmend höhere Noten. Die Sänger werden mithilfe einer klassischen „anwachsenden“ Melodie auf einer Welle zuneh­mender emotionaler Energie fortgetragen. Das Stück gehört zu jenen, deren Ganzes einen gewaltigeren Eindruck hinterlässt als die Summe seiner einzelnen Bestandteile. A Hymn for St Cecilia is a beautifully crafted occasional setting. Howells was an active member of the Worshipful Company of Musicians, one of the Livery Companies of the City of London with a history dating back to the middle of the fourteenth century. Once a powerful professional organization with complete control over musical performance in the City, the Company has long been a philanthropic and ceremonial organization and now supports musicians and musical education, awarding prizes, scholarships and medals. Howells was Master of the Company in 1959–60, and this tribute to the patron saint of musicians was commissioned by the Company in 1960. It was first sung in St Paul’s Cathedral on 22 November 1961 at an evensong to mark St Cecilia’s day. The text is a poem specially written by Ursula Vaughan Williams. 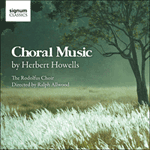 She wrote: ‘My St Cecilia is a girl in one of those magical gardens from Pompeian frescoes, a romantic figure among colonnades and fountains; Herbert’s tune takes her briskly towards martyrdom.’ Howells’ tune is one of his most memorable. The descant to the third verse was a happy afterthought. Added at the request of John Dykes-Bower, the cathedral organist, it lifts this simple setting onto a higher plane. A Hymn for St Cecilia («Hymne à sainte Cécile») est une œuvre de circonstance merveilleusement écrite. Howells était un membre actif de la Worshipful Company of Musicians («Honorable Compagnie de musiciens»), l’une des corporations de la Ville de Londres dont l’histoire remonte au milieu du XIVe siècle. Organisation professionnelle jadis puissante dotée d’un contrôle total sur les exécutions musicales dans la City, cette Compagnie est depuis longtemps une organisation philanthropique et officielle; elle soutient aujourd’hui des musiciens et l’instruction musicale en décernant des prix, en attribuant des bourses et des médailles. En 1959–60, Howells a été Maître de cette compagnie qui lui a commandé l’Hymne à sainte Cécile, hommage à la sainte patronne des musiciens, en 1960. Il a été chanté pour la première fois à la Cathédrale Saint-Paul le 22 novembre 1961 à un office du soir pour marquer la fête de la Sainte-Cécile. Le texte est un poème écrit spécialement par Ursula Vaughan Williams. Elle a écrit: «Ma sainte Cécile est une jeune fille dans l’un de ces jardins magiques des fresques pompéiennes, un personnage romantique parmi les colonnades et les fontaines; l’air de Herbert l’entraîne très vite vers le martyre.» L’air de Howells est l’un de ceux dont on se souvient le mieux. Le déchant sur la troisième strophe est une heureuse adjonction après coup. Ajouté à la demande de John Dykes-Bower, organiste de la cathédrale, il amène cette musique simple à un niveau plus élevé. A Hymn For St Cecilia ist eine vielseitig anwendbare, wunderschön gestaltete Vertonung. Howells war ein aktives Mitglied der Worshipful Company of Musicians, einer der sogenannten Livery Companies der City of London, deren Geschichte bis in die Mitte des 14. Jahrhunderts zurückreicht. Die Company—einst ein einflussreicher Zunftverband mit vollständiger Kontrolle über das Musikleben im historischen Stadtkern—fungiert seit langem als wohltätige und repräsentative Organisation, die heutzutage Musiker und Musikerziehung fördert sowie Preise, Stipendien und Medaillen verleiht. Howells hatte 1959/60 als Master of the Company den Vorsitz inne, und die Hymn for St Cecilia, eine Widmung an die Schutzheilige der Musiker, wurde 1960 von der Gesellschaft bei ihm in Auftrag gegeben. Zum ersten Mal erklang sie am 22. November 1961 bei der Abendandacht zum Fest der heiligen Cäcilia in der St Paul’s Cathedral. Der Text ist ein eigens verfasstes Gedicht von Ursula Vaughan Williams. Sie schrieb dazu: „Meine heilige Cäcilia ist ein Mädchen aus einem jener Zaubergärten auf den Fresken von Pompeji, eine romantische Gestalt zwischen Säulenreihen und Brunnen; Herberts Vertonung führt sie zügig ihrem Martyrium entgegen.“ Die Melodie gehört zu eingängigsten von Howells. Ein gelungener nachträglicher Einfall war die Oberstimme zur dritten Strophe. Ergänzt auf Wunsch von John Dykes-Bower, dem Organisten der Kathedrale, rückt sie diese schlichte Vertonung auf eine höhere Stufe. Herbert Howells’ A Hymn for St Cecilia was commissioned by the Worshipful Company of Musicians to mark Howells’ Mastership of the Company in 1959–60 and sets a poem by Ursula Vaughan Williams. 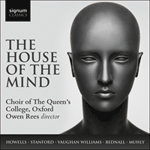 Paul Spicer rightly asserts that it is ‘a classic “cumulative” tune which carries the singer along on a tide of increasing emotional energy and leaves an impression of being a piece much bigger than its constituent parts’. 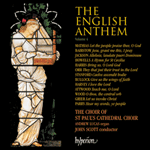 The anthem was first performed on St Cecilia’s Day in 1961 in St Paul’s Cathedral and the descant to the third verse was an afterthought added at the request of the cathedral organist John Dykes Bower. 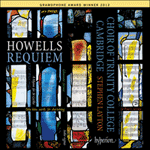 The latest Howells piece on the disc—A Hymn for St Cecilia—shows a very different side of Howells’ style. This setting of a poem by Vaughan Williams’ wife Ursula in praise of the patron saint of Music was commissioned by the Worshipful Company of Musicians (of which Howells was Master in 1959/60), and was first sung on St Cecilia’s Day 1961 in St Paul’s Cathedral. All three verses are sung to the same exultant melody. 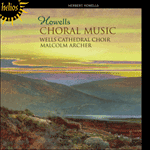 Howells evokes celebration particularly in the first verse (sung by all voices in unison or octaves) and the last, where a soprano countermelody rings out above the ensemble, suggesting the joining of earthly and heavenly music which the poem here describes.